In the end, kick-in-the-nuts-gate ended up hurting the Warriors more than the Thunder. The distraction of whether or not Draymond Green would be suspended for a deliberate/accidental volley of Steven Adams’s nether regions, somewhat tempered by a video that appeared on social media showing Green throw out a flailing and potentially maiming leg on several plays over the course of his career, proved to have little impact on OKC who were again driven by a strong second quarter – which they won 42-27 – to win 118-94. The Thunder again held Steph Curry to 2-10 shooting from deep, 6-20 overall and his 19 points were testament to the various injuries that he is not quite able to play through. He even missed two free throws, a statistical improbability given his career FT% of 90%. Kevin Durant and Russell Westbrook, who went 17-51 in game 1, combined for 62 points on 20-51 shooting. They were capably supported this time around by 17 point performances from Andre Roberson and Serge Ibaka. Roberson, Durant and Westbrook all grabbed double-figure rebounds as well, part of a triple double from Westbrook. Meanwhile, Draymond Green the triple-double machine only shot 14% and lost 6 turnovers. Coach Billy Donovan is answering the critics who thought he was a college recruiter and not a players coach. These questions persisted throughout the season. The Thunder lost assistant coach Monty Williams, one of a pair of experienced NBA coaches (Mo Cheeks was the other) who were hired to show Donovan the ropes, after the death of his wife back in February. It’s not hard to find articles criticizing the rookie head coach. One suggested he was repeating mistakes made by Scott Brooks. Others questioned the entire experiment and the trial-and-error aspect of Donovan’s first season. One article was even headlined “If Billy Donovan is the answer, then firing Scott Brooks was wrong”. Crucially, his style helps star guard Russell Westbrook. 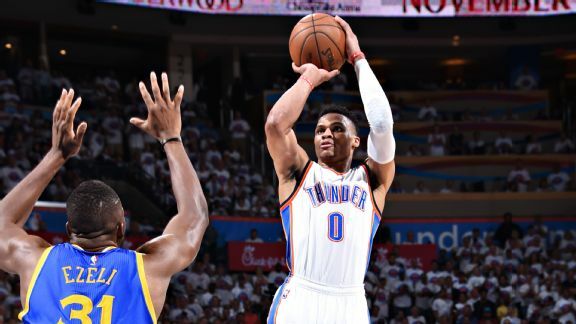 It is Westbrook who will drive the Thunder into the finals and beyond, if they are able to get there. In handing the defending champion Golden State Warriors their first back-to-back losses since last season, the Oklahoma City Thunder have put themselves on the brink of the NBA Finals for the first time since 2012. The franchise technically won the NBA title in 1979, but that title will be returned to its rightful owners – the city of Seattle – whenever the NBA returns to Washington state. The Warriors would need to win three straight games against a team that they have barely competed with in the last two. It’s not impossible – we’ve seen so much from this Golden State team that tells us not to write them off – but it’s only happened nine times in NBA history, most recently last year when the Houston Rockets pulled themselves out of a 1-3 hole against the Clippers. In all sports, teams up 3-1 have a 91% success rate. The 1996 Chicago Bulls followed their 72-10 regular season with the title and questions will be raised, and asterisks inserted, into the analyses of this team should they fail to capitalize on their historic 73-9 regular season. It’s now or never for this Warriors team. Will Courtside Collective be at the NBA finals this year? It was great to have an Irish interpretation by the guys on the ground! Fingers crossed! Media Application going in!